Just before news of Apple's upcoming 12.9-inch iPad Pro was reported by Bloomberg, Re/Code's Walt Mossberg shared a snippet of an interview with Apple CEO Tim Cook commenting on the recent state of the tablet market, which has been on the decline. According to Cook, the dip in iPad sales over the past two quarters is just a "speed bump" for Apple. In a brief interview about tablets I had this week with Apple CEO Tim Cook, he said, "We couldn't be happier with how we've done with the first four years of the iPad," and added that, "I'd call what's going on recently a speed bump, and I've seen that in every category." The sentiment echoes comments that Cook made during the company's third quarter earnings call, where Apple announced iPad sales of just 13.3 million, down from 14.6 million in the year-ago quarter. The drop followed a Q2 sales dip that saw sales of 16.35 million iPads, down from 19.5 in Q2 2013. During the call, Cook highlighted overall sales of more than 225 million iPads over the course of the last four years and suggested the tablet market itself was still "in its infancy." The CEO said that "significant innovation can be brought to the iPad," and pointed towards plans to bring improvements to Apple's tablet lineup. Part of those plans may include the introduction of a larger 12.9-inch iPad Pro, which will launch in early 2015, according to Bloomberg. Rumors have suggested the larger tablet will include an ultra high-definition display and that it will be marketed towards Apple's enterprise customers. While Apple has seen a serious drop in iPad sales over the past two quarters, the company continues to be the world's leading tablet vendor, holding 26.9 percent of the total tablet market. The company's iPad Air and iPad mini have hit 98% and 100% customer satisfaction rankings, respectively, and the iPad holds an 85 percent share of the U.S education market. Apple is not the only company experiencing a drop in tablet sales, as noted by Mossberg. Microsoft and Samsung have also seen slumping sales, possibly due to the fact that people see less of a need to upgrade their tablets on a regular basis, as suggested by Samsung, or the tablet's position as a want rather than a need. 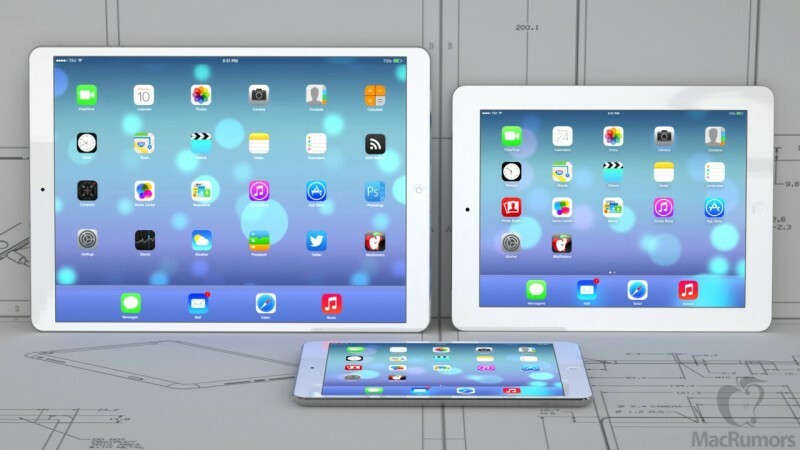 In addition to kickstarting iPad sales with the introduction of a larger iPad, Apple may see a jump in iPad sales during the last few months of the year, as the company is said to be introducing both a new iPad Air and a new Retina iPad mini with improved processors and a Touch ID fingerprint sensor. Touch ID proved to be a major draw for the iPhone, and its inclusion in the iPad may entice both new buyers and upgraders. Well, what bugs me about the iPad right now is that iOS simply isn't optimized for it. The music app is a stretched out phone app and the app switcher is just pathetic compared to what it could be. iOS needs real multitasking. Samsung and Microsoft have this and it really does improve tablet experience. The problem isn't the hardware, it is the software. iOS cannot be all things to all people. Software that is dumbed down to save on battery and so that grandma doesn't get confused cannot serve enterprise users effectively at the same time. I love the iPad. However, against popular belief that suggests the next iPad (Air) will come with just A8, better graphics and TouchID, I would like to see something more. I don't want a revolution, an evolution will do just as fine, but not just a routine "twice as better" update. Will buy one for every creative professional in this organization. ...Apple can keep trying to dance around it, but a tablet really needs a wacom digitizer if it's going to be the creative tool that replace the traditional stand-in of pencils and scraps of paper floating all over the place. A hundred years from now on into the future, you'll be able to accurately draw, sketch, and write on your tablet. Apple should buy Wacom and honor the licenses now while they can. They should have done it a decade ago. 1 quarter of lower sales for Samsung=LOLZ! Samedung is gonna die soon!!! There ya go, I saved everyone here an argument by making it before you did. That didn't take long. You ever get tired of carrying the flag? Obviously IBM doesn't agree. Didn't Apple announce a bunch of enterprise improvements at WWDC? A BIGGER IPad? Are we not moving to smaller products, I thought the new iPhone was supposed to fill the niche of a bigger IPad. How would a 5.5" phone fill the needs of a 12.9" tablet? iPads are fantastic. But here's what need to happed to revive seemingly declining market. 1. More OPTIMIZED OS. Currently it's just a glorified stretched up Phone OS. 2. TRUE multitasking. Side by side apps + floating apps. 3. Better support for pen/stylus. For students. Currently most stylus have tip as large as finger tips. Not a pleasant experience. They need to have a lower cost stylus that students can use. 4. Anti-reflective coating.. again for students as well as general consumers. Sorry dude, but pointing out flaws in your precious lovechild, Apple Inc., is not 'hating', it's being real. Also, just to be clear, this is Macrumors.com ... not MacLovers.com ... as you apparently think it is.